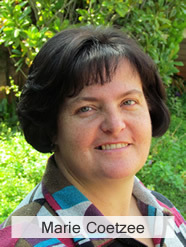 My name is Marie Coetzee. I have a passion for sewing and dressmaking since my youth. I studied at the Freestate Technicon and got my National Diploma in Clothing Technology in 1993. In 1994 started working for Pfaff and have been involved with Pfaff ever since. I bought my own PFAFF in 1998, it was the Pfaff 7570 and the first Pfaff embroidery machine available on the market. In 1999 I started my own small business in dressmaking. In 2005 I decided to add the Pfaff dealership to my business and that was the official beginning of Marie's Sewing Creations. Most of the sales of sewing machines were not towards dressmaking any more, but for hobbies like quilting. I wanted to learn more about quilting and my only option was to sign up for a lengthy beginners course. I wanted to be involved immediately and no-one was prepared to give me a crash course in quilting. After a long search I got in touch with the most wonderful person, Louise Rheeder, who stayed on a farm in the Freestate near Senekal. She invited me to her farm for a few days. 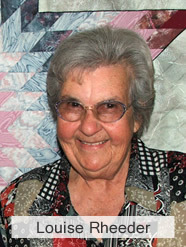 There she taught me all the basics I needed to know about quilting. I made my first quilt during those few days consisting of blocks with a variety of quilting techniques. Since then I have attended a few quilting courses and I now give beginner courses myself. I have a beautiful imported 100% cotton quilting fabric range in my shop which is a must see for every quilter. For me it is a privilege to be a Pfaff dealer and I enjoy the satisfaction which my Pfaff clients are getting from their Pfaff machines, whether it is a basic sewing machine or one of the embroidery machines. I am in the position to have a supportive husband, Stéphan, who is part of my business. He is our fully trained service technician and although he works only after hours, his work is of the highest quality. I have two lovely boys who are well-known to our clients. The elder one, Christo, is currently studying at University of Free State and the younger one, Ruan, is still at school and this year in grade 12. I hereby would like to thank all my clients. You are all very precious to me and make it only a pleasure to serve you with the best possible service I can. For all the new clients to be, please come and visit us and become part of the "Marie's Sewing Creations" family. Vir my Afrikaanssprekende kliënte, baie welkom by my eie webtuiste. Verskoon asseblief die Engels, ek hoop julle verstaan dat die web, wêreld wye bloodstelling geniet en ek moes die algemene medium gebruik in die uitleg daarvan. Snuffel gerus deur my webtuiste en stuur gerus vir my 'n e-pos om te sê wat jy daarvan dink.